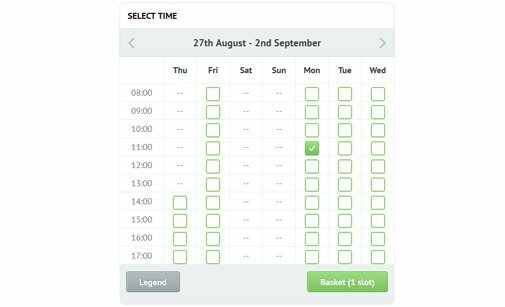 Availability Booking Calendar is a PHP calendar booking system that shows availability, allows bookings with a few easy steps, accepts online payments and lets you manage reservations and bookings. Our script is suitable for single accommodation facilities such as holiday rentals, private villas and apartments. 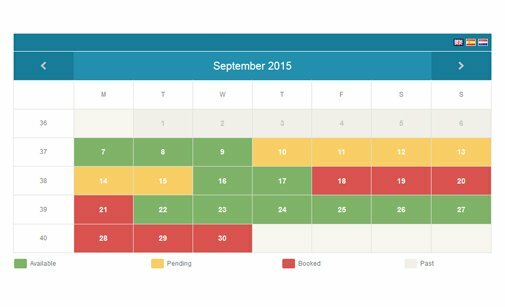 Availability Booking Calendar script allows you to change colors, edit languages, create booking forms and control settings. 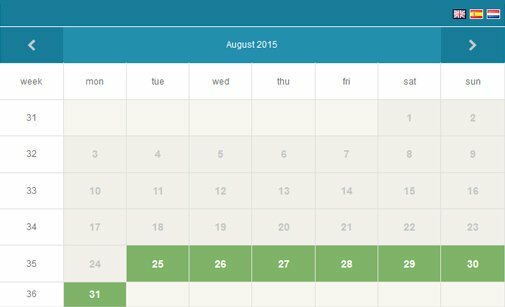 You can get the PHP booking calendar script with a developer-friendly license! Add a smart reservation calendar to your website and show your clients your service schedule online so that they can easily book and pay in advance. 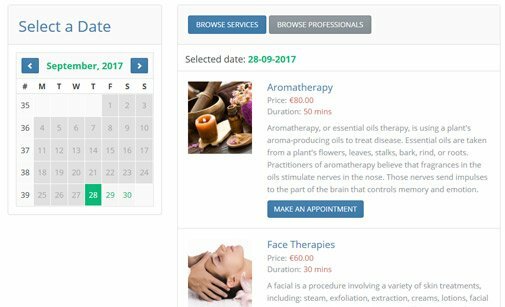 The Availability Booking Calendar script will facilitate and improve both your customer relationships and their administration. 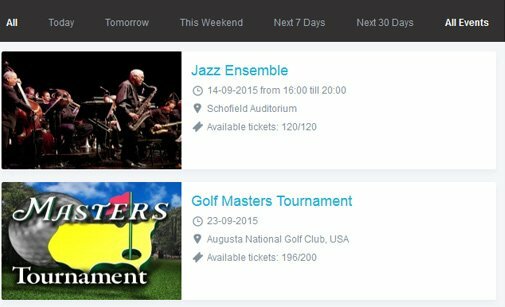 Create as many availability booking calendars as you need. Each reservation calendar can be configured separately. calendar script and add multiple languages on the front-end. make them fit your website style and contents perfectly. bases and loads quickly without reloading the entire web page. 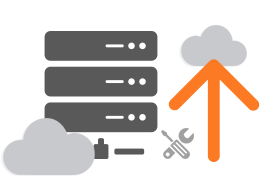 and manage both reservations and client details easily. The calendar booking system can be configured to send out Email & SMS notifications to users upon new booking or payment processed. The built-in payment module accepts online payments via PayPal and Authorize.Net. You can also process offline payments. You can either buy a Developer Licence and make your own changes, or get a User Licence and leave the custom modifications to us. Below is a preview of the Availability Booking Calendar script. You can see both the front and the back-end and test all its features. Preview some of the layouts offered for our Availability Booking Calendar. Click the button below to open the admin panel of the PHP calendar booking system. Review other scripts with similar functionalities which can complement or substitute the Availability Booking Calendar script. 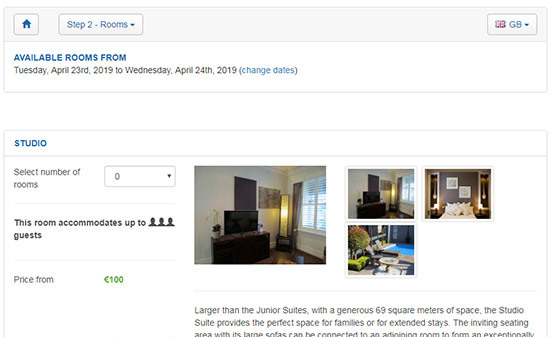 You can buy the Availability Booking Calendar either with a Developer, or with a User License. Holiday Property Website Builder with a built-in Availability Booking Calendar. 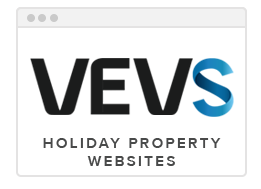 Let our clients share their experience with the PHP Availability Booking Calendar script and how it has improved their online business. After looking at the availability booking calendar script and studied it I bought it. While Swedish is not the most used language it started out with problems to use the special characters. It took less than one hour for PHPJabbers support team to solve this for me. Now the booking form works perfectly - well invested money! I needed a reservation calendar for a holiday cottage, which the people who own it could use without any knowledge of HTML and other coding what so ever. I found PHPjabbers.com, and a booking calendar script that suited me. Since I am not that of a sophisticated website builder, the people at Stivasoft supported me all the way, I could ask them anything on any moment of the day. I am extremely grateful for the way they guided me through the process, and I will do business with them again for sure! They rock!!!! The booking calendar script is easy to install and even easier to use. The code is well structured and organized, it is rather easy to modify just with some basic coding knowledge or fully customizable for advanced programmers. Additionally, the team quickly and competently answers to any customer question. Five stars more than deserved! I purchased the PHP availability booking calendar script along with several specific modifications. PHP Jabbers provided the new code on time and to a high standard. Their prices are competitive, their support has been brilliant, and their coding is genius. Thank you PHP Jabbers! I was looking for a PHP booking script and came across phpjabbers.com, but I wanted quite a few mods done. These guy sorted them out quickly and efficiently. The after sales support is fantastic as well. Thanks Alexander 'Sasho' Valkanov and Veselin Stoilov. This booking calendar script and these people are fantastic! I am a complete novice trying to build a website, the help I received from Veselin Stoilov guiding me through setting up my booking calendar online, was absolutely brilliant. 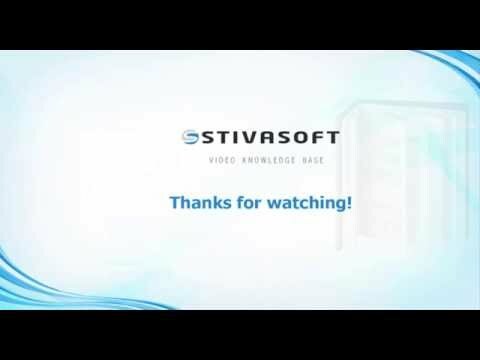 I can unreservedly recommend StivaSoft company and your site PHPJabbers.com. I highly recommend the Availability Booking Calendar script. 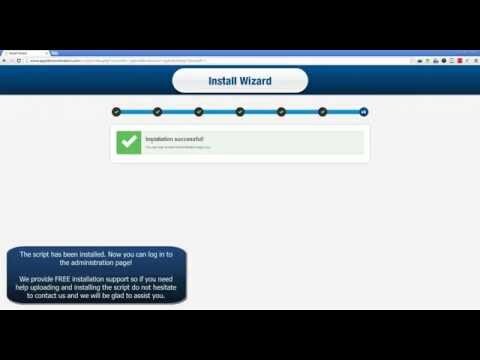 It is easy to install and administrate, yet it offers powerful features. This calendar booking system is also simple to use by customers. The PHPJabbers support is very quick and prices are very reasonable. Your Availability Booking Calendar is a superb script. You have included an excellent admin panel that covers every function you need to implement a first class calendar booking system. It worked 'straight-out-of-the-box' with no problems. My client is delighted, and so am I, (this has saved me an awful lot of programming, testing and subsequent hair-loss!). I would also like to comment on the fantastic support I received (concerning a minor bug - which was diagnosed and rectified within 6 hours of reporting - very impressive). I will definitely incorporate some of your other scripts in future projects and have already recommended you to a number of colleagues. Availability Booking Calendar works great and is very easy to use. Setting up might even be easier. Some questions about implementing the script on a Joomla content page were answered almost immediately and a styling issue resolved. Great tool, great team, great support! I came across PHPJabbers when looking for an online booking calendar to help reduce my booking inquiry administration. Straight away they seemed to be perfect for what I needed as the already extensive Pro package could be further tailored to suit my specific needs and branded to appear as an integral part of my site. From placing the order my booking calendar script was ready in just 5 days and the support received during the inevitable minor teething problems was excellent. I'm pleased to report that with the availability booking calendar having been on the site for just 8 hrs it has already paid for itself with the arrival of my first fully automated booking. Great stuff - no more inquiry emails to reply to, just confirmed bookings. Based on my experience I wouldn't hesitate to recommend PHPJabbers and Stivasoft to anybody and in fact already have done so. 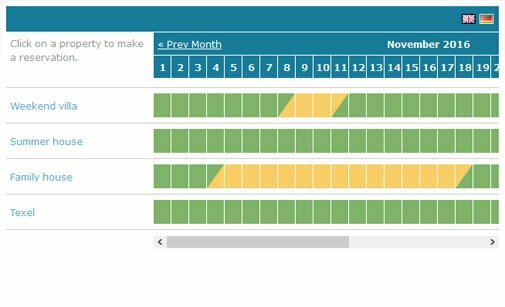 We have been using the PHP Availability Booking Calendar script since October 2007 and have to say it is absolutely excellent. Simplicity of setup and use was a major factor in our final decision to use it on the Sol Villas Spain website. Just perfect, simple to install, simple to use. Just what I needed. So happy with this PHP reservation calendar. My client has been using PHPJabbers' Availability Booking Calendar for some months now. I am pleased to say that both my client and I are very pleased with the product. The support required (mainly for self-modification) was concise and fast and this helped me to satisfy my client in a very short time. I am happy to highly recommend your reservation calendar script. Availability Booking Calendar from PHPJabbers and the guys who develop it are second to none! The booking calendar script is easy to install, and has lots of customizable features. These guys were very supportive, patient and above all very professional. I am a novice when it comes to installing and configuring software but nothing was too much trouble for them! I am very pleased with the results. Thank you again. I look forward to coming back for more great products and scripts! Read more about our Support Service and how we can help you install Availability Booking Calendar. Find how-to tips which will help you get the most of Availability Booking Calendar.